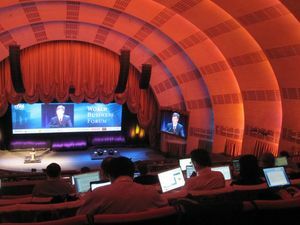 Earlier today the World Business Forum, one of the largest business events in the world, kicked off at the Radio City Music Hall in New York City. It was a fitting venue to host a range of visionary speakers that could rightly be called "rock stars" for their varied achievements in the world of business. I was invited as part of a cast of about 50 business bloggers to cover the live pulse of the event and managed to participate in a blogger meetup the night before the event started, as well as a few hours today. As regular readers of this blog know, I tend to make it to a lot of events and many of them are focused on such niche topics as the future of social media and how Twitter is changing business. I expected, after receiving the invite to WBF, that it would be illuminating in a completely different way about the world that we all work in. My hope was that it would offer a chance to contemplate a future of business in which social media was just one piece of the puzzle and not the whole story. In that respect, the first day of WBF certainly delivered. The speaker lineup for today included Harvard Management Guru (and bestselling author) Bill George, T. Boone Pickens, Jeffrey Sachs, Saatchi & Saatchi CEO Kevin Roberts and filmmaker George Lucas. Reading the stream of tweets from the dedicated bloggers at the event (hashtag/keyword #wbf09), it was clear that there were a lot of great soundbites coming out of the event. As I wasn't able to be at the event for the whole day, these tweets were the method by which I could partake in the live pulse of the event and as I read them it struck me at the "bloggers" the event had invited to cover it were largely choosing to do so through the real time 140 character limited tool of Twitter. As a result of these many tweets, as an outside reader piecing together the story of the event through these short bursts, it occurred to me that for my recap post from Day one, I would focus on what I felt was a trend that had emerged from all of these micro-observations: the importance of passion. Passion isn't necessarily a word that we typically equate with business. Yet listening to the stories of each of the leaders – passion was a common thread in how they approached their careers and achievements. Passion, to a degree, was what made them great at what they did … and what they looked for in the next generation of people they hired. Each of the men presenting today (and yes, unfortunately it was all men) – recounted as part of their point of view their own story of how their personal passion has driven them to do more. George Lucas shared his passion for storytelling. Kevin Roberts on his passion for creating something that people can't help but sharing. Even David Rubenstein (by far the most pessimistic in the group with his sobering presentation about the recession economy) preached being passionate about what you do and choosing something you love. In the surround-sound media environment of today, there is no shortage of places you can go to see an expert's view of business and where it is headed. 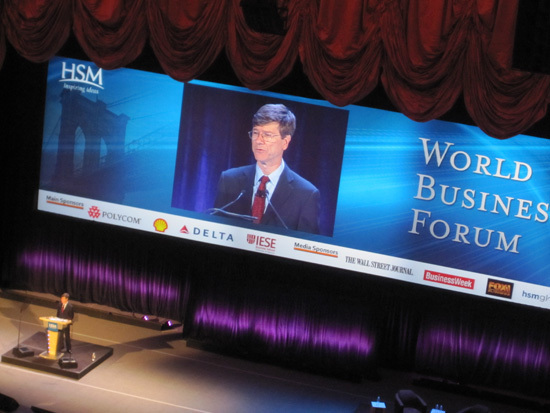 What I took from the first day of the World Business Forum, however, was just how important passion is as a common thread in the people (and their organizations) who are accomplishing something. The future of business isn't about leveraging Twitter or weathering the storm, or even finding the next great groundbreaking product. The ones who really change our world for the better will be the ones most passionate about doing it.